Danny vs. the internet: Did Earth spread life TO other planets? Scientists are spending a lot of time looking for worlds on which life may flourish — worlds like our own, or at least sufficiently like our own. How life would get there is a bit of an open question, but one possibility is a “panspermia” scenario where life is propagated between worlds by asteroids and comets. A new study on the subject of panspermia takes a look at a radical suggestion: That Earth has spread life to other, possibly life sustaining bodies. Kyoto Sangyo University’s Tetsuya Hara wanted to see if it was possible for bits of our planet to wind up on worlds that we currently think could harbor life. Hara’s research team looked at the Chicxulub impact — one of the largest known meteorite impacts in Earth’s history. 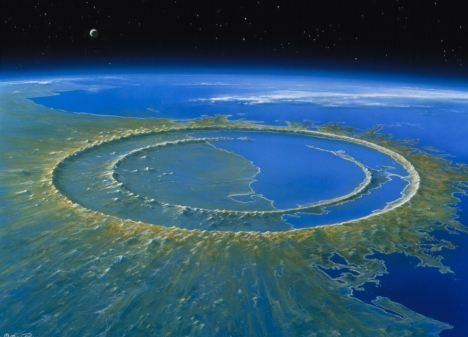 In addition to being blamed for wiping out the dinosaurs when it hit 65 million years ago, Chicxulub also knocked an enormous amount of material into the air and possibly off the Earth. Their research sought to determine how many of these tiny pieces of home may have made their way through space and landed in places possibly hospitable for life.